On a previous post I talked about my thyroid cancer survivor and awareness shirts I designed in honor of Thyroid Cancer Awareness Month. Well, September is long gone, but we should spread the awareness all year round. I’ve made a couple more designs since then, one that goes well on light and white t-shirts and another design which is less feminine, for male thyroid cancer survivors or loved ones. Check them out here. 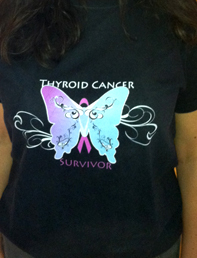 As before, 10% of net proceeds go to ThyCa: Thyroid Cancer Survivors Association. It might even make a good holiday gift for that survivor in your life, to show you appreciate the struggles and obstacles they have overcome. If you know a survivor, pass it on and help spread the awareness! Although, still in the midst of my treatment for papillary thyroid cancer, in the meantime I’m getting impatient about finding something useful to do about thyroid cancer awareness. When my treatment is finished (at least for now), I’d like to start a support group…however, until then, I thought I could design thyroid cancer awareness t-shirts. I already had a Cafe Press account, so, to hit the ground running, I uploaded a couple designs to my CP page. 10% of net proceeds will be donated to ThyCa: Thyroid Cancer Survivors Association. Spread the word, not the cancer! Spreading awareness of the disease can lead to earlier detection in patients (like myself) who may not have known to have their neck checked. Awareness also leads to greater funding in ThyCa research…which may lead to improved treatments and maybe even, a cure! Roughly 1500-1800 people die every year of Thyroid Cancer and countless others have multiple surgeries and radiation treatments for stubborn cases of ThyCa.